Echinacea is a perennial undersized plant with multiple short roots. Echinaceas stalk simple, but thanks to the ability strongly to branch and to abundance of rough leaves, they look attractively. Leaves have the next structure, the size is closer to the top part of stalks than them to become less. 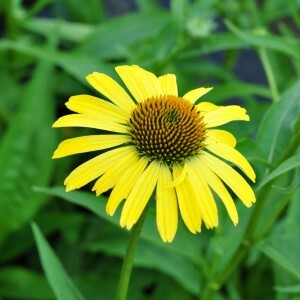 Tops of stalks of an echinacea crown the flower baskets most often having a spherical form. The color and the size of flowers of an echinacea vary depending on a grade. The plant starts blossoming in the summer, on tops of stalks always there are a lot of motley tubular flowers which fructify. Echinacea was widely adopted in Europe. This perennial excellently grows on solar sites, loves fertile soils, but to call it whimsical it is impossible.